Care Bears are a thing from my childhood that I have a great deal of nostalgia for. 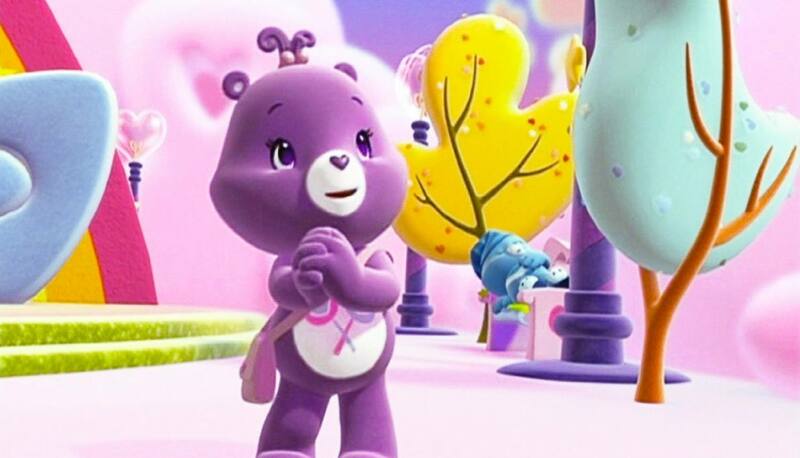 Cheer Bear was my favorite of all the Care Bears - the one with the rainbow across its belly. I remember a time when I would lift up my shirt and shout "Care Bear Stare" at any problem, and it always made me feel better. I was excited when the movie arrived in the mail, and immediately started talking it up to my three year old son. 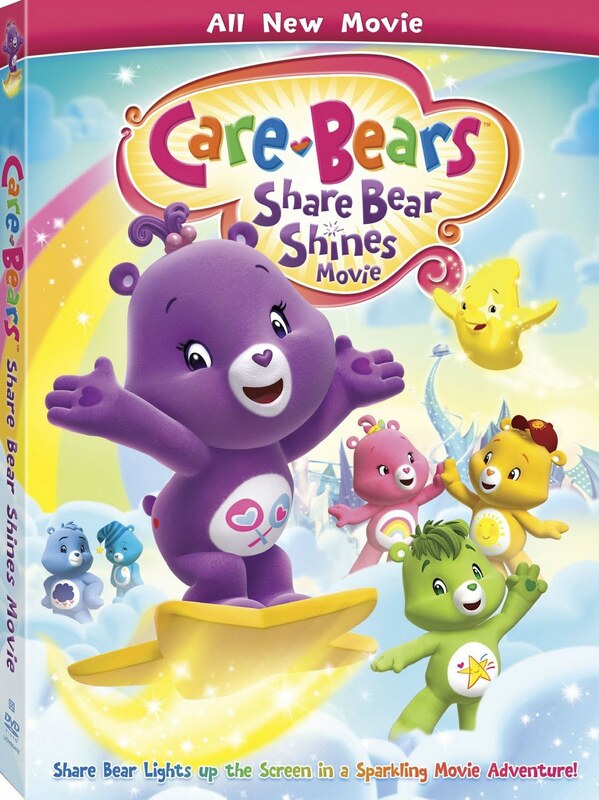 I realize the Care Bears are a little girly, but I thought the bright colors and the sparkly DVD case would intrigue my son. I was wrong. He actually cried "no mommy, I don't want to see that" as I put in the DVD. The trailer for the Leap Frog movie quickly grabbed his attention and I was pleasantly surprised that he sat through the entire movie and seemed to enjoy it. 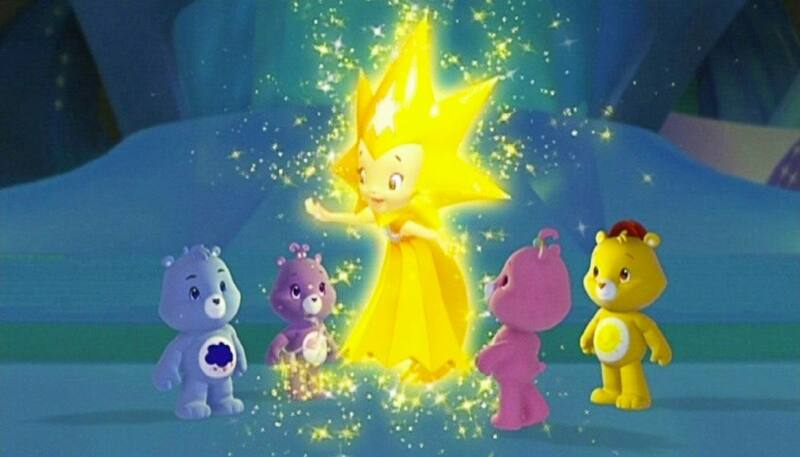 Everyone in Care-A-Lot loves the story of Princess Starglo, but only Share Bear truly believes in her. Princes Starglo takes the baby stars, known as twinklets, and turns them into stars, choosing a special place in the sky for each one. 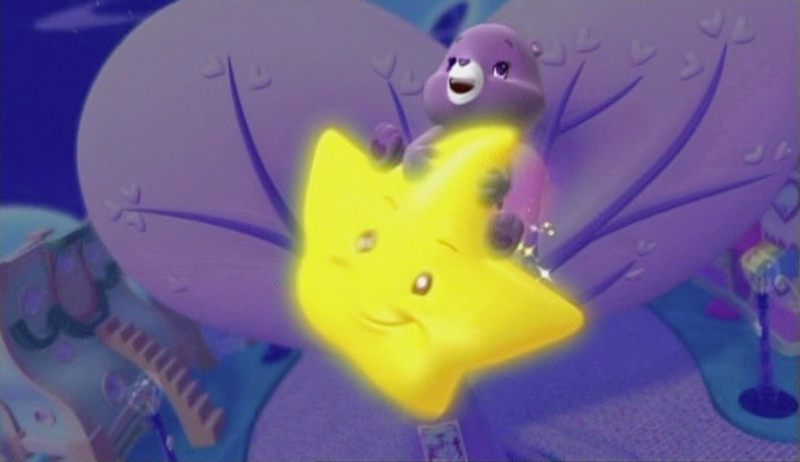 A twinklet named Gleamer ends up stranded in Care-A-Lot and Share Bear takes off to help the baby star get home. Back in Care-A-Lot the lack of starlight is creating a big disturbance. The Care Bears are all sleeping because it’s dark out. Luckily Bed Time Bear can go into their dreams to wake them up so the Care Bears can solve the problem. Because no one believes in Princess Starglo, her confidence has dimmed and she no longer has enough power to keep her home, Glitter City and all of the stars in the sky lit. 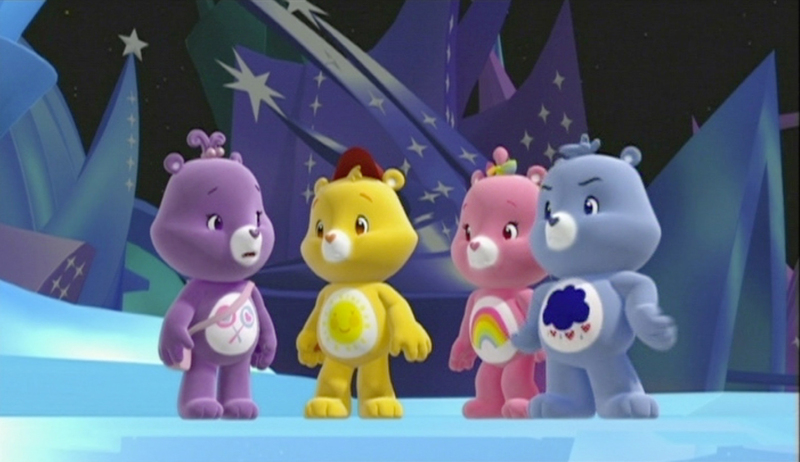 In typical Care Bear style, the Care Team follows Share Bear and are quick to help. Five believers are quickly made, but even that is not enough power to help Princess Starglo. Finally, a Care Bear Stare jump starts Princess Starglo, and the skies are bright once again. Care Bears: Share Bear Shines is presented in Widescreen 1.78:1 ratio. This is a computer generated animated feature, and I was impressed. The images are sharp, the colors are vibrant and the care bear furtones (there are no humans to warrant a comment about skin tones) are true to memory. While the video was pretty good, the English 5.1 Dolby Digital Audio was just good. I never noticed anything special in the audio department. I never felt I was surrounded by twinklets or Care Bears but really didn't expect much from a straight to DVD Care Bear movie. Here is where the Care Bears let me down. For a kid’s movie, I expected special features full of songs, some stories, and maybe a few games. There is one game, and I'm going to be completely honest and admit I couldn't do it. • Unlock the Shine Interactive Game - Using your DVD remote you are supposed to align the locks, and then click the Believe button. I failed on lock number three and I don't know what happens after that. Even the hint, which is a completed picture, did not help. My son had no interest in trying the game. 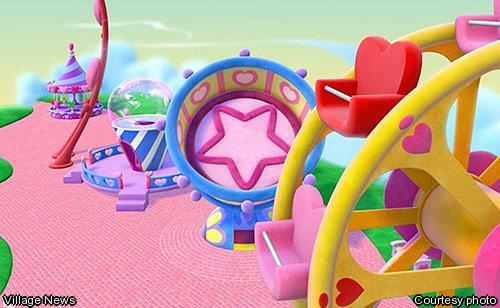 • Trailers - Trailers for Happily N'Ever After 2, The Care Bears: Big Wish Movie, and Care Bears: Journey to Joke-A-Lot. Care Bears: Share Bear Shines is a very cute movie. If you hate the Care Bears, or are even indifferent to them, I doubt this movie is going to win you over. But if you look fondly on your own little Care Bear you slept with as a child, you'll probably find this one pleasing. I'm happy to see details like the little red hearts on their little Care Bear butts. It is a very simplistic movie and there is not a lot to the plot (as seen by the short plot summary) and the running time is only 70 minutes. I think it's perfect for the preschool crowd, with short attention spans. Okay, so it also appeals to a 33 year old woman who wish they had kept their favorite Care Bear. Order your copy today by clicking on the image below!